With the Amendments feature any participant can edit the text of a proposal and a “sub-proposal” will be created as an amendment. This amendment may gather endorsements and supports. The author of the original proposal may accept or reject the amendment. If it’s rejected, the author of the amendment may convert it into a new proposal. Decidim includes now a configurable contextual help system to guide participants in the use and understanding of the platform. On one side, the "More information" section is now called "Help" and there you can create different pages grouped by topics. 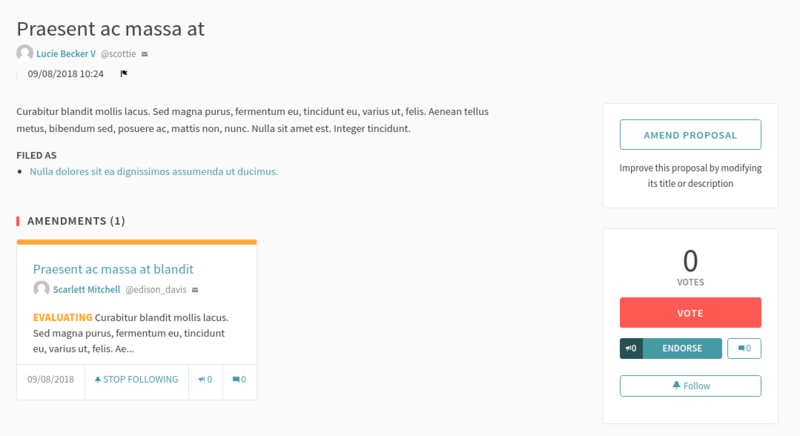 There are some texts poulated by default and they can be modified and customized from the admin interface. On the other side, in the header of each participation space a collapsible banner is shown with a brief explanation of it. When a participant registers for the first time she receives a welcome notification with links to the help pages. 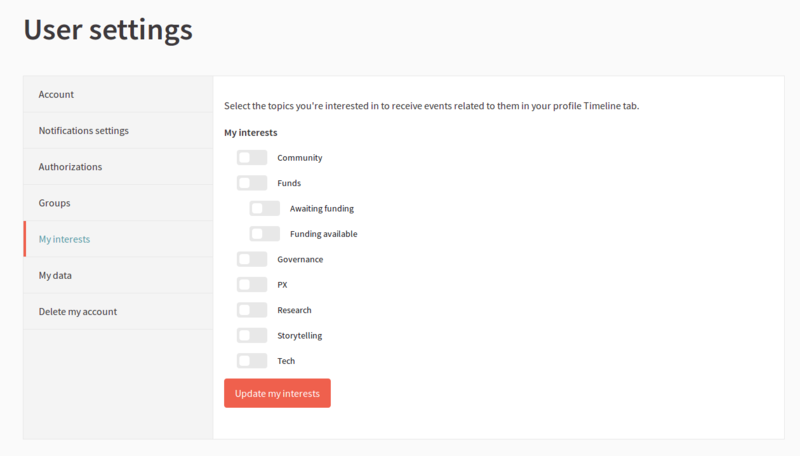 To enhance the participant's experience on the platform, she has now options to choose the topics that interest her and be informed about them. There is also a new tab “Activity” where she can monitor her own activity within the platform..
For some participatory processes we might want to allow participants to a) assign proposals to several categories, or b) search proposals by category from different participatory processes at once. This feature defines an additional use of hashtags: extra hashtags. These are regular hashtags added to a content, but with an special character to mark them as "extra" for that particular uses. There are automatic and suggested hashtags. 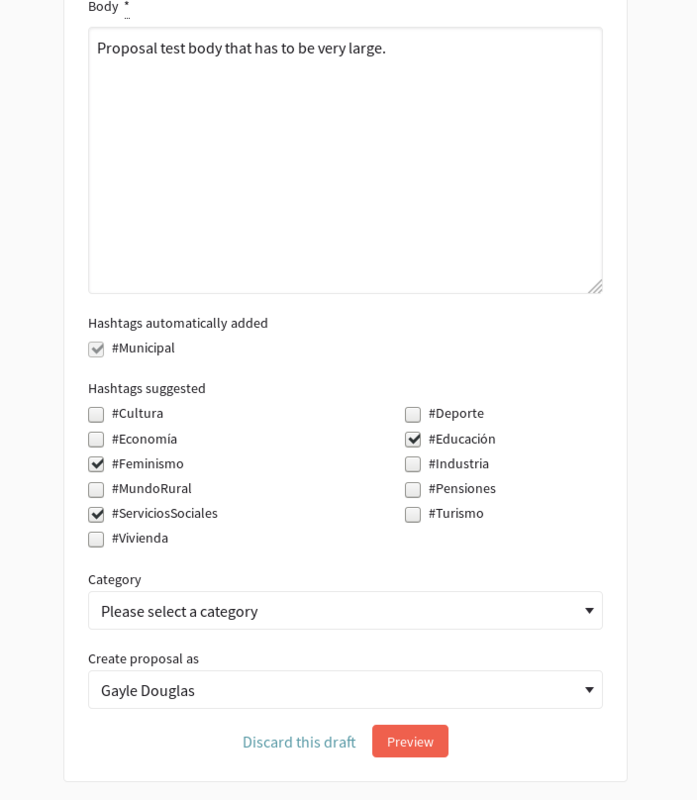 Automatic hashtags are hashtags that are assigned by default to all proposals created in a proposals component. Suggested hashtags allow to define a set of predefined hashtags that can be offered to participants to improve organization of the proposals, also to improve global search results. Online: the user uploads a picture of their document and fills the document type and number. The admin receives the submission, sees the picture and fills the document type and number. If both submissions match, the user is verified. Offline: The user doesn't upload any picture, only fills the document type and number. Then visits the admin. The admin needs to fill the user email, document type and number. If all data match, the user is verified. Open Data for meetings, proposals and results.